Measurements: 1mm Diameter. 4 braids of 3 yards each for a total of 12 yards. Characteristics: This cord has a cotton core with a rayon outside layer. 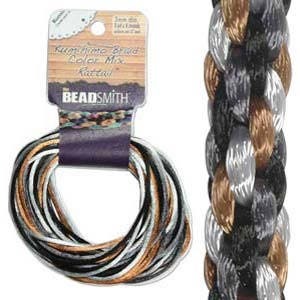 It is perfect for Braiding, Macrame or Kumihimo. Produces one 18 inch braid. *Changes in dye lots may cause slight variations in coloring. Also, cord is not color fast.